The Arena series is a characterful and quirky addition to Murat's pantheon of high quality and distinctive cymbals. Quirky looks and sounds. Build quality. 18" crash too dry. Price. Murat Diril is the Turkish cymbalsmith who collaborated with Meinl on its Byzance series and with Paiste on its 20 series. Now Murat has his own extensive line of cymbals which we first reviewed last year. In addition to those we have here the Arena series, which was developed in collaboration with German drummer Juan Roos. "The Arena series was developed in collaboration with German drummer Juan Roos"
All Murat Diril cymbals are hand-made in Turkey using an extra-pure B20 bronze alloy. 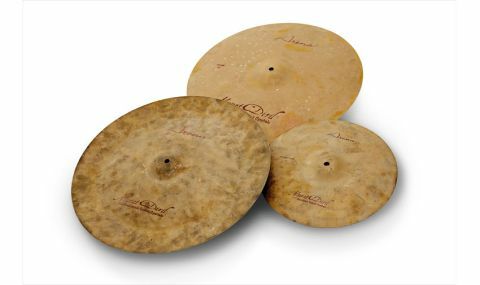 Arena cymbals are distinguished by their sandblasted tops, a matt chalky sand colour with dashes of yellow and sparse blotchy light hammerings. The underside of the crash and hats have regular lathing with a brilliant finish; the china is sandblasted on both sides. The 12" hi-hats have four rivets and two one-inch holes in the bottom cymbal. The look is completed with logos in blood-red script. The full range runs from 6" to 24". We've got three of them to review, all priced between £252 and £261. When you swipe the medium thin 18" crash you get a fast reaction with a keen edge, but with a dark trashy and short explosion which dies abruptly, leaving a softer, dry, medium length sustain. The 18" china is rather more powerful. Strike this on the upturned edge and there is a really intense pang with the expected trashy oriental undertow, fairly deep tone, good body with about as much sustain as the 18" crash. It seems like more because the initial impact is brighter. Invert the cymbal and attack the shoulder and it is crushingly brash. Despite being thin, the 12" hi-hats are quite high-pitched and perky, sharp and spirited. The small diameter together with the rivets and bottom holes give the cymbals a brightness which you don't normally get with thin hats. The rivets in the bottom make a big difference when you have the cymbals part open, but they add a cutting extra dimension when they are closed. The pedalled chip sound is also well defined. The combination of all these factors makes the half-open sound a really sharp and shrill blast. It's almost like striking a small china on the edge, but with the control and bite afforded by a pair of hi-hats. The 18" crash we found a bit too dry and short on sustain, but the 18" china and 12" hi-hats were lively and characterful. The unusual, fast hats will work well in electro and small group jazz settings. And you'll really make your presence felt with the china.